When the Ford Mustang ushered in the pony car era in mid-1964, other domestic manufacturers took notice. The Mustang was an instant success and every division within the Big Three wanted a piece of that pie. Mercury was no exception. Ford's sister company approached the project with an eye toward not only the Mustang, but toward the bigger, more luxurious Thunderbird as well. The new Mercury would fall somewhere in the middle. It would be aimed at a demographic slightly more sophisticated than the Mustang set, yet not so established as the typical Thunderbird buyer. Development work commenced immediately, and the Cougar debuted in 1967, sharing the basic platform of the second-generation Mustang, though a bit bigger overall, including a wheelbase increased by three inches. It also shared some components with the Mustang, notably in its mechanicals and cabin, though it was better appointed and priced as such. Styling was reminiscent of the Mustang shape, but a bit more flowing, with a rocker panel character line and a subtle crease above the front fenders, continuing along the top of the doors, and curving up into a broad C-pillar before ending at the rear of the car. A wide grille with vertical bars concealed the headlights, while a similar treatment at the back concealed the taillights. 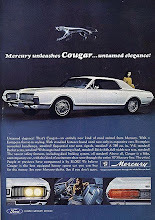 The Cougar came only as a two-door hardtop and was an instant success, much the way the Mustang had been. The automotive press lauded it as a luxury sports car, and Motor Trend named it "Car of the Year" for 1967. Standard power came from a two-barrel 289 V8 delivering 200 hp, though a four-barrel 289 with 225 hp was a popular upgrade. Four transmissions were available, including a 3-speed manual, a heavy-duty 3-speed manual, a 4-speed manual, or the Merc-O-Matic, which now included Select Shift to give the driver more control. While based on the Mustang's suspension, the Cougar offered longer rear leaf springs and stronger spring and axle components to control ride harshness. A GT package placed a serious emphasis on performance. It included a four-barrel 390-ci V8 with 320 hp, dual exhausts, and a firmer suspension with solid rear bushings, a larger stabilizer bar, fatter tires, power steering, and power brakes with discs up front. Mid-year, Mercury unveiled the XR-7, a more upscale model with wood-grained interior trim, an overhead console, a T-handle automatic shifter, and combination leather and vinyl seats. Also available as part of the XR-7 package was a Dan Gurney Special, which honored the racer's involvement with Mercury's Trans-Am program. Mercury upped the options list for 1968, to include Tilt-Away steering, a vinyl roof cover, a basic handling package, several radios, and a sports console. Side marker lights also appeared, now federally mandated. Most notable, however, were the new engines. A four-barrel 302-ci V8 rated at 230 hp joined the lineup, while a second 390 slotted in below the GT motor at 280 hp. 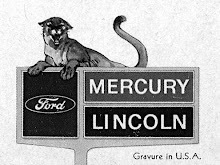 To satisfy the most power-hungry buyers, Mercury offered a 427-ci V8 with 390 hp and a substantial 460 ft-lb of torque, though the motor's weight overwhelmed the car and it was replaced late in the model year by the new 428 Cobra Jet. It was rated at 335 hp, though most people peg the mark closer to 400 horses. Special models for the 1968 year included the GT-E, which came standard with the big-block engine and Merc-O-Matic, plus stiffer suspension, adjustable shocks, wider tires, quad exhausts, special front and rear grille designs, and unique steel wheels. Meanwhile, the XR-7G furthered the Dan Gurney theme. It offered a hood scoop and hood pins, fog lamps, GT exhaust extensions, and could be optioned with just about any component or engine a customer wanted. For 1969, Mercury restyled its pony car. Wheelbase remained the same, though the car's other dimensions grew in nearly all directions. Gone was the two-piece grille and its vertical members, and the taillights were revised. Gone also was the rocker character line, replaced by a crease that arced down from the front fender. 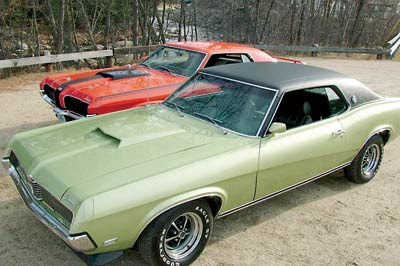 Mercury dropped the GT-E and XR-7G, though it added a convertible, as well as an Eliminator hardtop. The Eliminator was comprised of two different equipment groups and included several interior and exterior appointments, such as high-back bucket seats, a unique instrument cluster, a rear spoiler, and styled steel wheels. A two-barrel 351-ci V8 appeared, putting out 250 hp. It came standard on the Eliminator, but with a four-barrel and 290 hp. Optional on the Eliminator was the 428 CJ. In its first three years of production, the Cougar sold nearly 365,000 units, though 1967 was its best year, with sales declining every year after. In both pony car and luxury car terms, it did exactly what Mercury hoped it would—bridge the gap between the Mustang and Thunderbird, while offering the best of both cars. The Cougar name would evolve over time into bigger, slower, less sport-oriented cars, but there's no denying the capabilities and qualities that made the first-generation Cougar so attractive to buyers then and collectors now.